This book follows on from the original Reading Zone and contains a set of humorous reading and comprehension sheets spread across ten high interest thematic groups. Themes include: The Circus, The Earth, The Farm, Holidays, Scary Stuff, School, Sports, The Universe, Villains and The Zoo Each theme is composed of five activity sheets and a set of answers. The five types of activities are: Find the List Word; Word Study Activity; Check It Out; Comprehension; Spot the Difference. 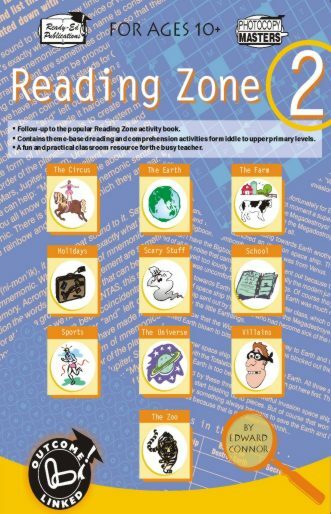 Reading Zone 2 (NZ Version) 831795 15.95 readyebooks Fresh Download Available!